This thrilling 7-day tour takes you to the best national parks of Uganda- Kibale, Queen Elizabeth and Bwindi. Track gorillas, chimpanzees and other primates, go on nature walks in Maramagambo Forest, spot tree climbing lions in Ishasha, view stunning Mubende and walk the Rwenzori Foothills. This exciting Uganda adventure starts at Kampala with a briefing about the safari after which the journey to Fort Portal will be made via the town of Mubende set amongst rolling hills. Mubende is a town in western central Uganda. It lies to the west of Kampala. Mubende is famous for the Nakayima Shrine, known to hold the spirit of Ndahura, a former Bacwezi king. Enjoy a picnic lunch en route, where you get to relax and absorb the beautiful landscape around you! Afterwards, continue onwards to Kibale National Park. On arrival at the lodge in late afternoon, you will be checking-in for two nights stay. Relax at the lodge or explore the nearby crater lake. Ndali Lodge, lying 26 kilometres south of Fort Portal, is set amidst the Bunyaruguru crater lake region of Western Uganda. The sight is stunning and you have the opportunity to experience the wonders Ndali has to offer! There is a main thatched lodge with spacious sitting room, reception area and dinning room flanked by 8 cottages which face west offer a panoramic view of the spectacular 'Mountains of the Moon.' They are built of local stone and thatch. The interiors are imaginatively and comfortably furnished where the decor empahsis is on the use of local materials. Track noisy Chimps and other primates in Kibale National Park today, crashing around through the high canopy of the forest, with colourful birds squawking nearby. Kibale National Park in western Uganda, was established in 1993. The park adjoins the Queen Elizabeth National Park and is an important ecotourism and safari destination. The park protects a well studied, habituated population of common chimpanzees, as well as several species of Central African monkeys that include the Uganda Mangabey, Red Colobus and L'Hoest's Monkey. Other large animals that live in Kibale include Leopards, Buffaloes, Giant Forest Hogs, Bushpigs, three species of Duiker, two species of Otter and about half a dozen types of Antelopes. Avian species that can be seen here in particular include noisy Hornbills, two species of Pittas (African and Green-breasted) and African Grey Parrots. Several species of reptiles and amphibians are found here as well. We get to enjoy a packed lunch amongst the greenery! In the afternoon take a walk in Bigodi to see the swamp birds. Also get to see some of the community projects financed by tourism in the region. You can also enjoy the scenic area around the lodge. It is located on the rim of an extinct volcano and it invites you to an unforgettable experience! The volcano, since its quieting down, has filled with water to become the breathtaking Lake Nyinambuga – 250 acres in size and 130 metres deep. Today, you have the option of going for a walk in the foothills of the Rwenzoris (one of the great mountain ranges of the world) looking out for the strong, sturdy and dangerous peaks looming in the distance. The Rwenzori Mountains, located on the border between Uganda and the Democratic Republic of Congo, are also called the Mountains of the Moon. They are known for their vegetation and animals. From tropical rainforests through alpine meadows, there is a six meter high heather covered in moss to snow. The animals range from Elephants, to varieties of Giant Groundsel and Giant Lobelia as well as several primate species to many endemic birds. Most of the range is now a World Heritage Site. As an alternative, you could otherwise drive straight to Queen Elizabeth National Park. 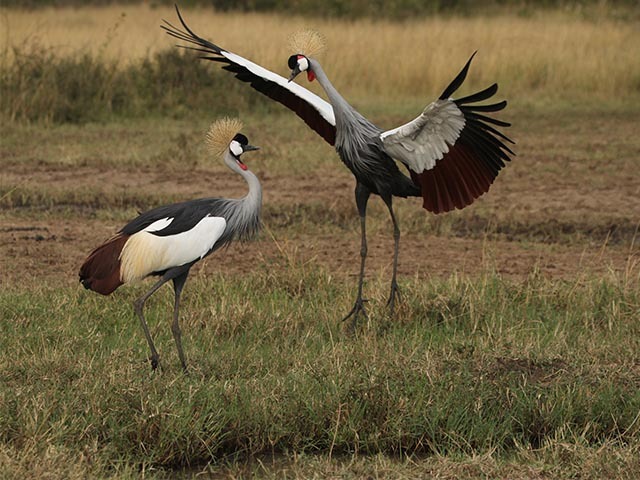 The Queen Elizabeth National Park is Uganda's most visited game reserve. The Kasinga Channel, which runs through the entire stretch of the park, has a huge concentration of Hippopotami. Animals usually seen roaming in the park are Warthog, Buffalo, rare Aquatic Sitatunga Antelope, Giant Forest Hog, Uganda Kob as well as Topi, Waterbuck, Elephant and Leopard. The area around Ishasha in Rukungiri District is famous for its tree-climbing Lions, whose males sport black manes, a feature unique to the Lions in this area. The park boasts of a rich birdlife as well. One of the common birds seen here is the giant sized Pouting Shoebill (or Whale-headed) Stork. The fertile land of the park is further beautified by volcanic craters, grassy plains as well as tropical forest. The Kasenyi plains in the park are good for Lions and is best explored in the morning. Mweya Peninsula, which extends into Lake Edward, has a population of over 400 Banded Mongooses. One can also find Lion, Leopard, Genet, Civet, White-tailed Mongoose, Egyptian Mongoose, Hippopotamus, Waterbuck, Buffalo, Elephant, etc. here. Crocodiles are regularly observed by the lake shore and Monitor Lizards as well as Snakes (including the Rock Python) are common. The headquarters of Queen Elizabeth National Park is in Mweya. It should be noted that the game seen will depend on the season. Our adventure continues with a quest to find Chimpazees! In order to track the quick moving and elusive Chimpanzees, an excursion to Kyambura Gorge nearby is planned today. As the Chimp population is quite mobile, viewing of Chimpanzees is unpredictable but, nevertheless, the walk is captivating and enchanting. Alternatively, go for a nature walk in Maramagambo Forest to see other primates and to visit the Blue Lake. In the afternoon, take a boat cruise on the Kazinga Channel to spot the wildlife and a vast array of birds that visit the lake. 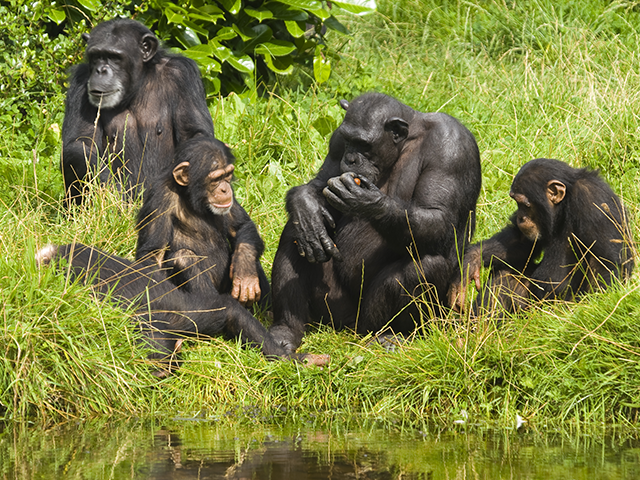 Kyambura Gorge, situated on the northeast boundary of the park, houses many Chimpanzees. The thick treetop canopies and dangling vines provide an ideal place for them to play and hang around. Chimpanzees along with many monkey species are also commonly seen in the Maramagambo Forest, located to the south of the Kasinga Channel. Your accommodation for two days will be arranged in Mweya Safari Lodge. 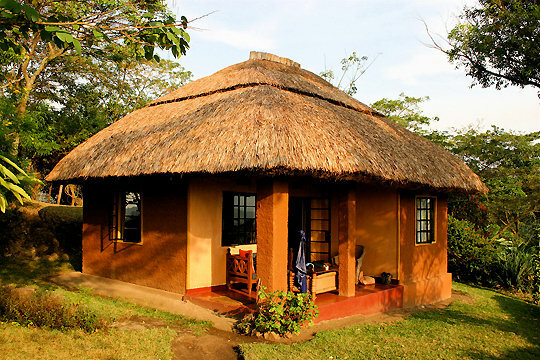 Located in the Queen Elizabeth National Park, this lodge offers superb opportunities for game viewing and ornithology. The lodge also boasts of a number of rare attractions that are exclusive to Mweya Safari Lodge alone. Bidding farewell to Mweya Peninsula, we set out to Bwindi Impenetrable Forest. A drive through Ishasha, home of the tree climbing Lion, may be made (if the roads permit) or an alternate route can be taken through cultivated expanses. If there is some extra time, take a short stroll around the lodge or enjoy yourself exploring the village. Bwindi Impenetrable National Park, located in southwestern Uganda in east Africa, covers an area of 331 square kilometers and contains both montane and lowland forests. The Bwindi Impenetrable National Park is a UNESCO-designated World Heritage Site. The forest is one of the richest ecosystems in Africa. Bwindi is thought to have one of the richest faunal communities in East Africa. There are an estimated 120 mammal species here, 10 of which are primates, and more than 45 of which are small mammal species. In addition to the endangered Mountain Gorillas, other mammals in the park include the common Chimpanzee, L'Hoest's Monkey, African Elephant, African Green Broadbill, Cream-banded Swallowtail, Black and White Colobus Monkey, Red-tailed Monkey, Vervet, Giant Forest Hog and small Antelope species. Many carnivores can be found here as well, including the Side-striped Jackal, African Golden Cat and African Civet. The park has more than 350 bird species, including Hornbills and Turacos and more than 200 butterfly species. In spite of housing such varied wildlife, Bwindi Impenete National Park is best known for the 340 Bwindi Gorillas that live here. This number constitutes half the world's population of the critically endangered Mountain Gorilla. There are four Mountain Gorilla groups open to tourism: Mubare, Habinyanja, Rushegura near Buhoma; and the Nkuringo group at Nkuringo. Gorilla tracking is the park's main tourist attraction. Today go Gorilla tracking, which is subject to permit availability at the time of booking. It is quiet an adventure to walk up the steep and densely forested hills before finally coming across Gorillas camouflaged in the vegetation. It will hopefully prove to be a truly inspiring moment! Tracking in Bwindi requires stamina and can often take most of the day. Alternatively go for a leisurely nature walk or visit the local communities. Your accommodation for two days will be arranged in Volcanoes Bwindi Lodge. 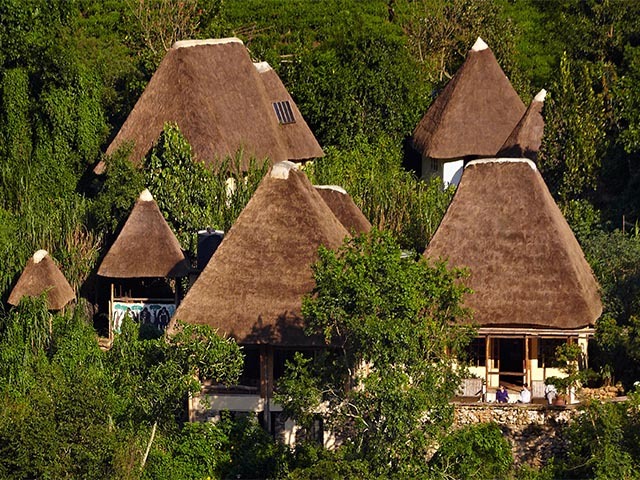 The safari lodge overlooks the Bwindi forest, home to Gorillas, Monkeys, Chimpanzees and Birds. Tracking Gorillas in the so-called ‘impenetrable' forest is a magical experience. At this stunning eco-lodge spend some time on the terrace, which juts out into the forest. Get ready to be mesmerized by the exotic sounds all around and get to watch primates and birds in the canopy! The walk to the river through the buffer zone is magical. It is a favourite haunt for the Gorillas! On the last day of this exhilarating journey, an early start is made for Kampala. You retrace your steps through this green and pleasant land. Enjoy a picnic lunch en route. Arrival at Kampala will be late in the afternoon. The largest city and the capital of Uganda, sporting a tropical wet and dry climate, Kampala grew as the capital of the Buganda kingdom, from which several buildings survive, including the Kasubi Tombs (built in 1881), the Buganda Parliament, the Buganda Court of Justice and the Naggalabi Buddo Coronation Site.